The simple answer for uncomplicated and healthy pregnancies (and 4-6 weeks post partum following straightforward vaginal delivery) is YES. After receiving the go ahead from your midwife or obstetrician there are some simple guidelines to follow. There are two main types of exercise to consider: cardiovascular and strength training. While continuously monitoring your current pregnancy status thru the trimesters is important, you must also heed your pre-pregnancy level of fitness. The Society of Obstetricians and Gynecologists of Canada advises that with the go-ahead from your health care professional, for those with at least 6 months of previous activity, “sports or workouts” can be safely continued. 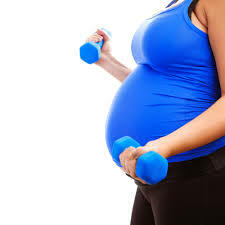 They further advise that for those with a history of inactivity, to start exercising in the second trimester; adopting a “low and slow” (low impact) regime including both cardio and muscle toning exercises. Health link BC suggests the use of massage therapy during pregnancy as an aid for “relaxation and to help relieve muscle tension and pain”. The body makes many accommodations for the growing fetus and endures hormonal changes in joints to allow for eventual delivery. For some the resultant laxity or looseness in the joints is pain free but other women unfortunately experience aches and muscle pain adapting to the added weight and postural changes that occur during pregnancy. Choose a therapist with the right training. All registered massage therapists in BC receive education that applies to the treatment of pregnant patients. Be aware that special pillowing and modified tables may be used and/or your treatment position could eventually remain in side lying for your comfort and safety. Every woman and every pregnancy is different. I know women who because of their pre-pregnancy athletic lifestyles completed ½ marathons at 7 ½ months gestation, managed step aerobics until 7 months and did yoga until the day of delivery. It would be folly to start training for a 10km timed event, if you were not already fit enough to complete one before pregnancy. And eventually, like a patient who stopped bike commuting to work at 7 months, safety must be your priority. Be smart, modify as necessary and listen to your body! Call INSYNC PHYSIO at 604-566-9716 to book your Massage Therapy appointment today. Michelle has had varied experience in her massage therapy career, working in sports, spa and general practices in Vancouver, Whistler and Victoria. After graduating from the WCCMT in 1996, she upgraded her basic diploma to enhance her practice skills and then went on to complete a Health Science Degree from Thompson Rivers University (2011). Michelle is a member in good standing with the College of Massage Therapists of BC and the Massage Therapists Association of BC. After 15 plus years of practice Michelle remains passionate about her profession and is keen to continue learning; she loves helping people feel better. Michelle employs various techniques such as trigger point therapy, fascial release, joint play and Swedish massage to help address headaches, pregnancy related issues, sports injuries and work related concerns, such as low back pain. From recreational sports enthusiast to computer programmer at the desk, many different people can benefit from massage therapy. Michelle stays active with her young family enjoying biking, hiking, yoga, golf and fitness classes.